one thing he can provide: a story. Frank lives for his father's tales of Cuchulain, who saved Ireland, and of the Angel on the Seventh Step, who brings his mother babies. Perhaps it is story that accounts for Frank's survival. Wearing rags for diapers, begging a pig's head for Christmas dinner and gathering coal from the roadside to light a fire, Frank endures poverty, near-starvation and the casual cruelty of relatives and neighbors -- yet lives to tell his tale with eloquence, exuberance and remarkable forgiveness. 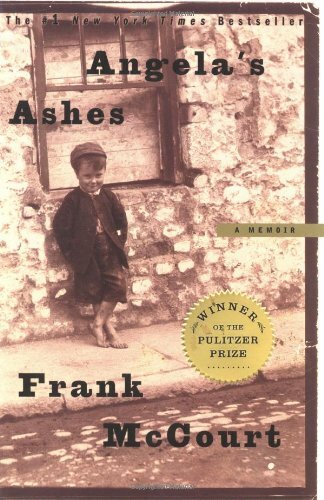 Angela's Ashes,imbued on every page with Frank McCourt's astounding humor and compassion, is a glorious book that bears all the marks of a classic. During this time, he would occasionally write articles for newspapers and magazines. He retired from teaching in 1994. His first memoir, Angela's Ashes, was published in 1996. It won the National Book Critics Circle award in 1996 and the Pulitzer Prize in 1997. His other memoirs included 'Tis and Teacherman. He died on July 19, 2009 at the age of 78.